SFIIs böcker distribueras av eddy.se ab. Byzantion, Constantinople, Istanbul … In spite of the popular imagination envisioning its history in terms of sharp breaks and divisions between different religions, cultures, and empires, the city often shows a remarkable continuity in its geopolitical role as a zone of interaction and nexus between seas and continents. As the capital city of three empires spanning centuries, it demonstrates the political continuity of the Late Roman, Byzantine, and Ottoman empires. From an economic perspective, goods and gifts, people and groups moved past and through it alongside more abstract cultural artifacts such as stories and iconographies. 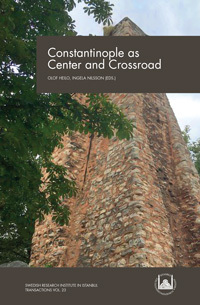 This book transcends the geographical and historical divides that pervade the perception of the city by focusing less on the city as such than the space it occupies, the wider areas it connects, and the agents or actants that have passed through it from the Late Antique to the Early Modern era.